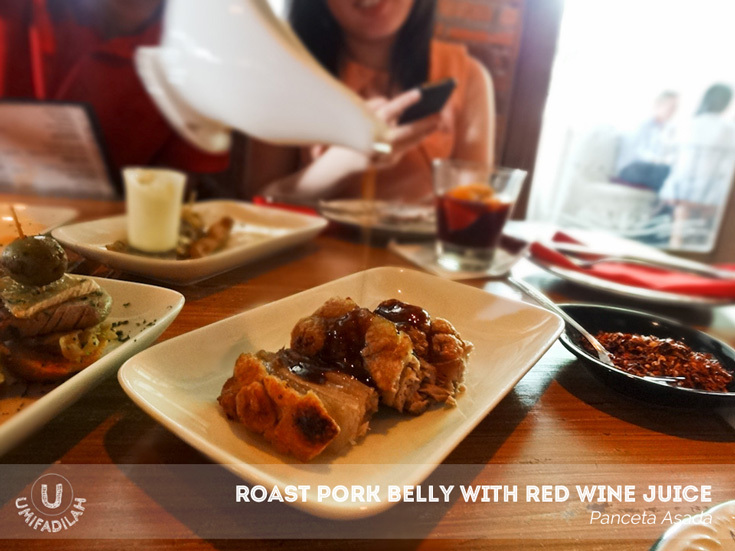 With its tagline written at its brochure, "Enjoy a little taste of Spain in every bite", Tapas Movida surely meant every word of it. We had lots and LOTS of both tapas & raciones to accompany the main star: Spanish Paella. 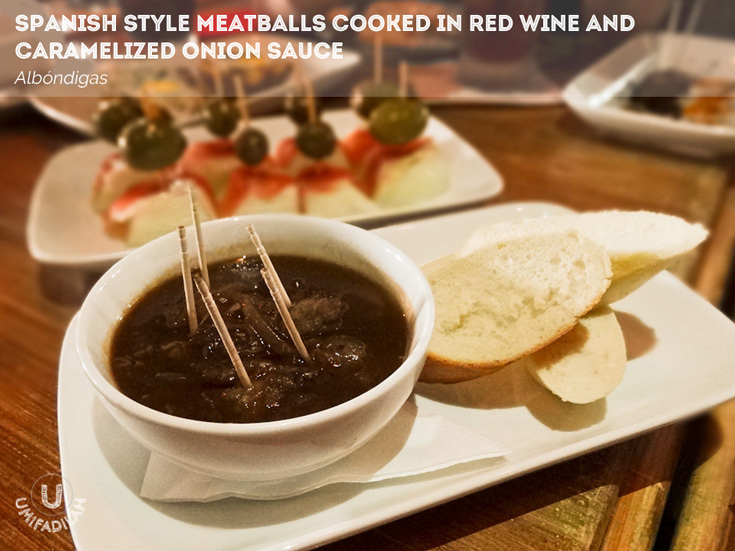 Pinchos/Tapas, also known as appetizers/snacks in Spanish cuisine, can vary from cold to warm snacks, and usually have toothpicks in every bite-sized portion of it. Raciones, on the other hand, are often just a larger portion of tapas. These two are usually big enough for sharing. Chicken Skewers with Yoghurt Sauce & Cheese (IDR 17.500,-). I love the yoghurt & cheese dipping! Beef Tenderloin, Blue Cheese, Olives and Caramelized Onions (IDR 30.000,-). Oh yes, tenderloin and cheese just CAN'T go wrong. It's like Spanish burger. And luckily I don't have problems with blue cheeses. Candied Potato Layered with Smoked Salmon and Apple Compote (IDR 30.000,-). This was heavenly. Smoky aroma, sweet hint from the apple compote, combined with tender crisp potato, OMG. Meatballs! a.k.a Albondigas (IDR 45.000,-). This soup is one of Spanish' comfort dish, and you should give it a try. Kidding, I mean it's a DIE DIE MUST TRY! Gigantic collections we had that day, huh? We felt like it kept coming, endless, and we hadn't even begun main course. 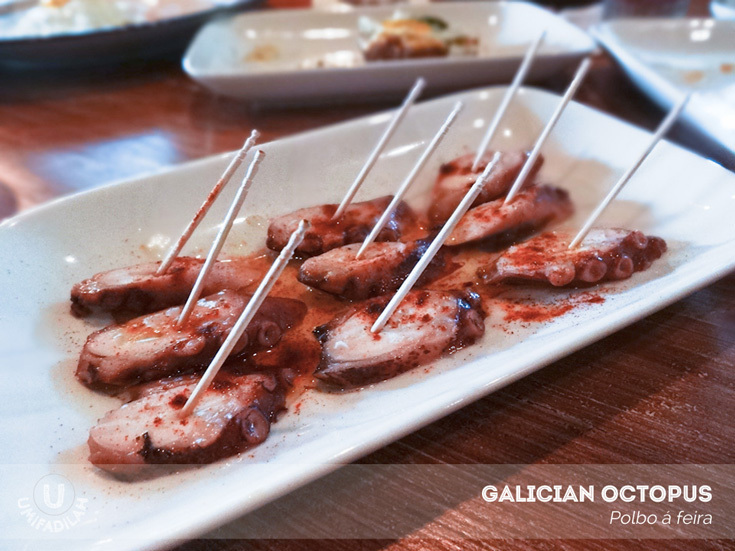 And we also get to taste their specialty of the day, the super tender "Galician Octopus" (Polbo á feira - which is priced at wicked IDR 250.000,-! It's imported and seasonal only, I guess). I don't complain much about their superb pinchos, but for some dishes I personally felt it was a wee bit too salty, sorry to say, including the latest octopus dish. I'd still prefer Japanese octopus sushi over this. 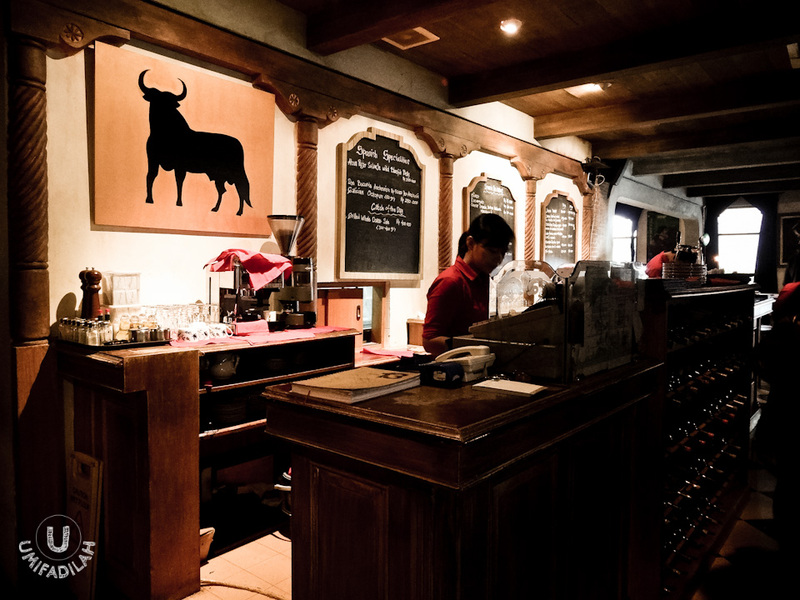 Tapas Movida's specialty beverage is Sangria. A traditional Spanish wine-punch which is a mix of red wine, a bit of lemon juice and assorted chopped fruits, usually apple, orange and pear. If you're into red wine and fruit punch you definitely have to try the authentic one here. In fact, they have 2 types: Traditional Sangria (IDR 295.000,-/jug) and Deluxe Sangria (IDR 475.000,-/jug) - with the main differences being the 14 different spirits mixed into the Deluxe one, so I'm guessing it's much much stronger than the traditional one that we had. I, too, had a sip of their non-alcoholic mocktails called "Tropical Energy", with real peaches on top; and "Saint", mix of ginger ale, mint and lime slices. Refreshing! And then finally it was the time to taste our main dish of the day. Actually there were two. First one being the infamous Chicken & Seafood Spanish Paella (IDR 330.000,-). Traditional Spanish yellow rice (from the use of Saffron), with a very generous amount of chicken, seafood and vegetables, giving that super fragrant smell that I wished I could inhale everyday :p I honestly haven't found any other good Paella in Jakarta for comparison, but I can tell that this was definitely good stuff. The second main course was Roasted Lamb Shank (IDR 195.000,-), which was surprisingly HUGE. Haha, I don't think I ever seen such lamb-shank that big, on a plate. No, in fact it's not even a plate, it's served in a glass pyrex. And judging from the looks of it, I knew it wouldn't disappoint. The lamb jus was magnificent!! The lamb shank itself were easily fall-off-the-bone type when you cut right into it, and the asparagus had the perfect crunch of not being overcooked. Perfect. Honestly I have had better churros before, but the chocolate dipping is what differs from the rest. I can tell that it was good quality chocolate. It made me smile :) (and want to drink the dipping cup). P.S: It's more crowded especially at night, and on several occasion they also provide live music and promotions like "Sangria Sunday" - where you'll get FOUR JUGS of Sangria + 1 Paella for 4 person at IDR 250.000,- each. So reservations are recommended upon visiting. 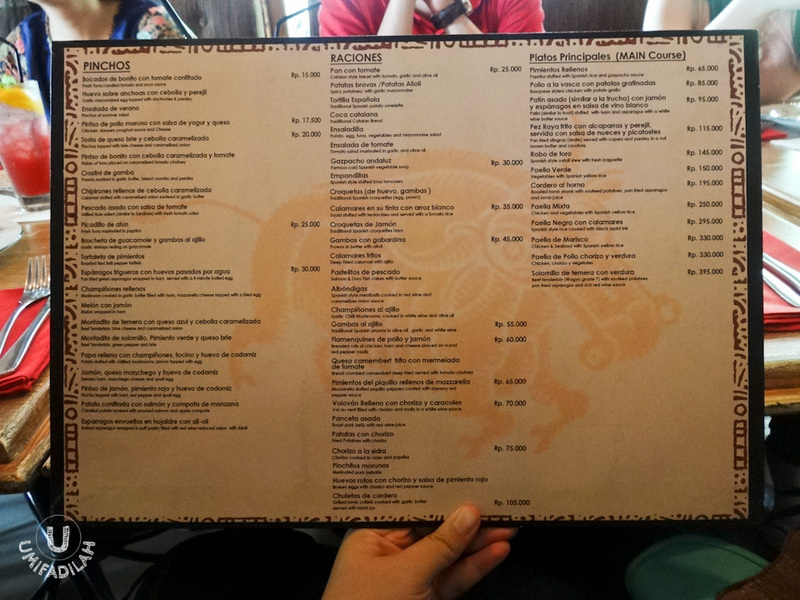 Do check-out their comfy decor and warm ambiance below. Perfect for dining with family, friends and the loved ones. Live music are there every Saturday night. Totally loved the place!